Welcome to the Ultrasound Leadership Academy (ULA) summary blog series. This week, we summarize ultrasound in trauma. 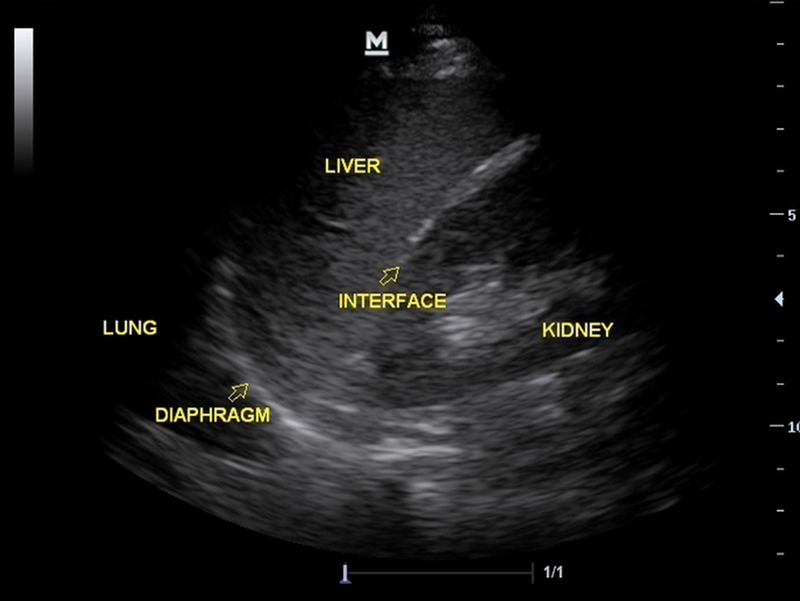 The ULA is essentially an online advanced ultrasound education experience put on by the team from Ultrasound Podcast which brings cutting edge learning to emergency medicine personnel through a variety of interactive platforms including video lectures, google hangouts with experts, simulation, live conferences and real time scanning with a pocket-sized ultrasound device known as a Vscan. Ultrasound provides us with a window into the trauma patient whom often is altered, or has significant distracting injuries, which prevents us from identifying occult injury. There are multiple potential spaces within the body in which occult injury can lead to significant blood loss without external evidence of compromise. Our job in performing ultrasound in the trauma patient is to identify this bleeding (free fluid) in potential spaces within the body in order to provide immediate intervention, if necessary, or assist with timely disposition of a patient to the OR. The scan we perform in the trauma, the 'FAST' Exam, stands for Focused Assessment with Sonography in Trauma. We will touch on the EFAST here as well which is the FAST exam + a brief lung ultrasound to evaluate for pneumothorax and hemothorax. Even if you aren't trained in ultrasound this is one scan that anyone can quickly learn how to do efficiently and effectively. The FAST scan can be performed simultaneously with ongoing resuscitation. The FAST scan identifies a need for the OR for a patient with blunt abdominal trauma and can be used effectively to identify lesions that may need to be intervened on emergently. DO KEEP IN MIND that in pediatrics, greater than 1/3 of solid organ injury are without free fluid. Also, many blunt abdominal injuries in children are managed non operatively. This makes the FAST exam somewhat less useful in children. What about EFAST (FAST + Lung US)? With EFAST, your can quickly identify lesions that need to be intervened on (i.e pneumothorax, hemothorax, pericardial effusion). EFAST allows this is < 60 seconds. The ultrasound sensitivity for pneumothorax in a supine patient is 88% while chest x-ray is a measly 52%. Absence of breath sounds also is a poor predictor of pneumothorax. The RUQ is the most dependent region in the abdomen and is the most sensitive region (80-85%) to detect free fluid during the fast scan. You are looking for free fluid in Morrison's pouch which lies at the interface between the kidney and the liver. Around 200cc of blood will be visible as a positive fast. Use the liver as your window, if you are having difficulty in midaxillary line, try sliding to a more sagittal oriented position. Be sure to find the tip of the liver and inferior pole of the kidney! While the is the spleen is the most commonly injured organ in blunt abdominal trauma, hemorrhage from this organ usually drains to the RUQ. That being said the LUQ is still a critical view and will add to the sensitivity of your FAST. Note that the spleen is a much smaller organ than the liver, making your window a tad more difficult. Always start more superior and posterior to try to hit this view straight on. You will often be over multiple ribs with shadows so you may have the patient inspire deeply to move away artifact. 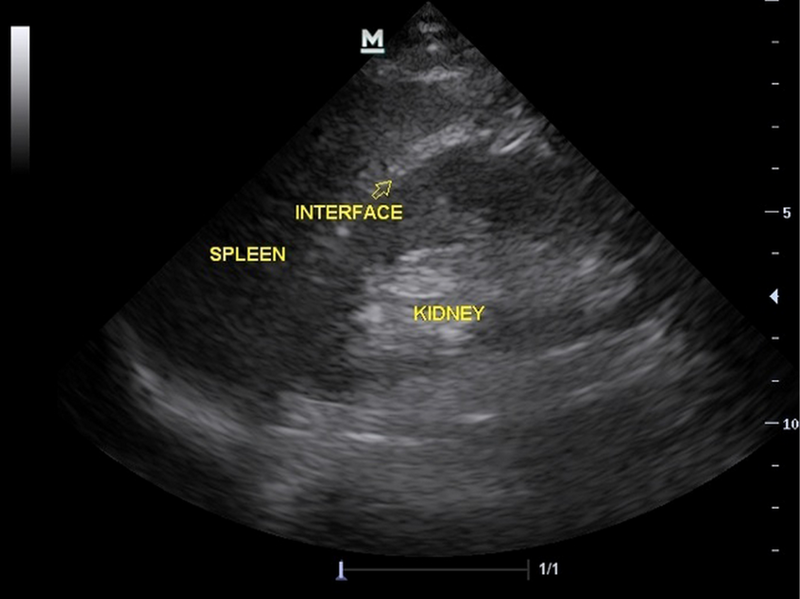 Beware the suprasplenic fluid: You may find a normal interface between spleen and kidney but free fluid can hide superior to the spleen so make sure you visualize this potential space. 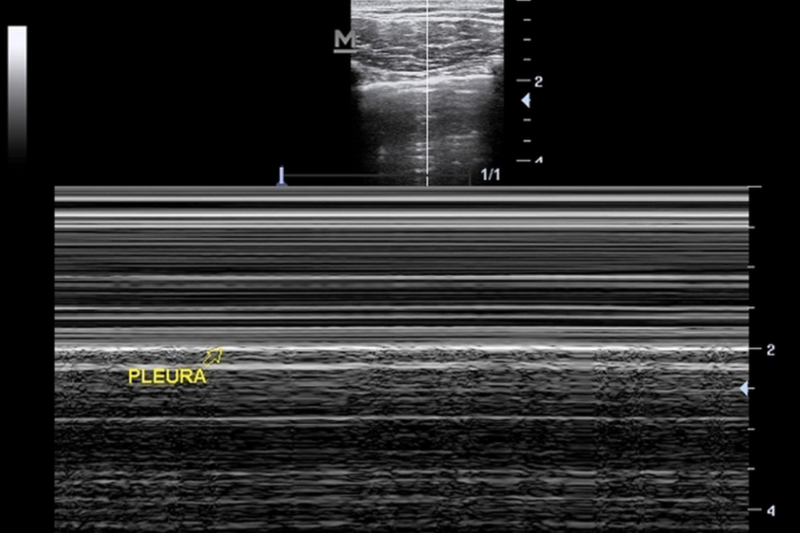 Perinephric fat can appear like free fluid in both the RUQ and LUQ. Compare both sides as this will usually be present bilaterally. Look for heterogeneity in what you believe to be free fluid as perinephric fat should not be completely anechoic. The pelvis looks different in males and females so review your anatomy. Remember back to medical school that the bladder is not completely peritoneal. Make sure to be perpendicular and directly over the bladder to obtain proper view and avoid viewing the extraperitoneal space posteriorly. In males if you are seeing the prostate, you're extrapertioneal so slide your probe inferiorly and change your angle. In females make sure to look both anterior and posterior to the uterus as fluid can track in either of theses spaces. The bladder is fluid filled, so you can expect some acoustic enhancement posteriorly which may obscure free fluid. Be sure to adjust gain (either overall or in far field) to account for this. The seminal vesicles in males can appear as an anechoic region that appears like a frown. Don't be fooled by this, it is not a positive FAST! Fan through this region and you should see the seminal vesicles splitting off into individual tube like structures. You are looking for pericardial fluid. While we are concerned more about pressure in the pericardium and not the size of the effusion, any pericardial fluid should be taken seriously as it is almost always blood and there may be ongoing bleeding into this space. Subcostal: Look anteriorly as this is most dependent portion of pericardium in this view. Hold the probe like a spoon, this will allow you do get the probe flatter along the surface of the patient. Intuitively we want to slide to patient's left if no view, however the liver is our acoustic window so try sliding to patient's right and rock towards patient's left. 15% of patients (usually obese or from bowel gas), you will be unable to get a subcostal view. Think of a little man jumping on a trampoline and the trampoline is the wall of the RV. If you can imagine this, you should be concerned about tamponade. A pericardial fat pad can sometimes appear as a positive pericardial window. However pericardial fat pads will usually appears slightly less dark. It can also be useful to think about the fact that the heart will move within a pericardial effusion, while the heart will move with a pericardial fat pad. The EFAST is often a portion of the FAST that is not done however it can rapidly detect both hemothorax and pneumothorax is < 60 seconds. Hold your probe in sagittal plane directly over left and right side of chest in 3rd or 4th intercostal space. Linear probe is best, but you can use abdominal probe as well as this will be most efficient since it will likely be difficult to switch out probes during scan. You are looking for sliding along the interface between the visceral & parietal pleura during respirations. Use b-lines to your advantage (these are rapid reverberation artifacts that signify fluid or consolidation in lung) and if you see them, you know the lung is up. Also look for a spine sign: Normally the spine above the diaphragm is not visible since US waves are not able to travel through air within the lung. If you see the spine above the diaphragm, this suggests there is fluid (or consolidation) present that is allowing US waves to pass through. Now the EFAST in 60 Seconds. All of the US Images in this post were provided by 'INTRODUCTION TO BEDSIDE ULTRASOUND', VOLUME 1 & 2, FROM DR. MALLIN AND DR. DAWSON. IF YOU ARE INTERESTED IN PURCHASING THese EBOOKS for less than $1, VISIT ULTRASOUND PODCAST CONSUMABLES. The FAST exam at Emergency Ultrasound Teaching.